This home's handsome exterior combines with a functional interior to provide an exciting floor plan design which includes two fireplaces, a sun room, and a loft/study. The generous great room with vaulted ceiling accesses the sun room and deck through sliding glass doors and is overlooked by a loft/study above. The U-shaped kitchen easily serves the light-filled dining room which features a bay window and sun room access. The master suite is privately located on the second floor with a cathedral ceiling, built-in shelves, its own fireplace, and sun room balcony access. 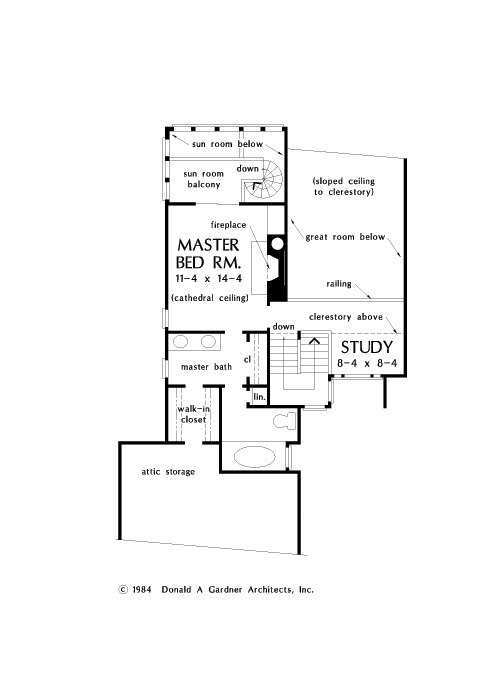 The master bath contains a whirlpool garden tub, ample closet space, and access to attic storage. 1st Floor: 1340 Sq. Ft.
2nd Floor: 547 Sq. 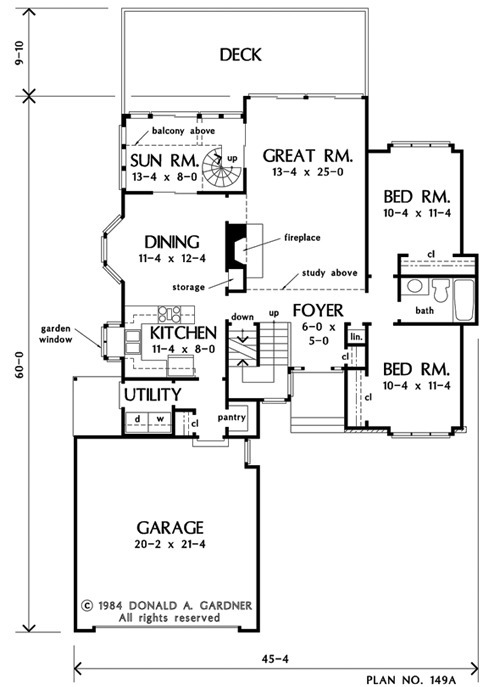 Ft.
House Dimensions: 45' 4" x 60' 0"
Great Room: 13' 4" x 25' 0"
Master Bedroom: 11' 4" x 14' 4"
Porch - Front : 6' 0" x 5' 4" x 0' 0"
Porch - Left : 5' 4" x 6' 6" x 0' 0"
Deck / Patio : 27' 8" x 9' 10" x 0' 0"
Loft / Study (Vaulted): 8' 4" x 8' 4" x 12' 10"
Balcony : 13' 4" x 3' 8" x 8' 0"
Storage (Other) : 1' 8" x 2' 4" x 8' 0"
Storage (1st Fl.) 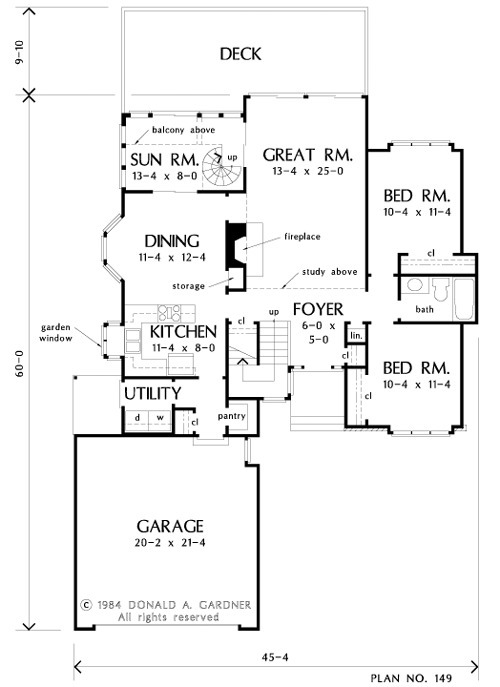 (Sloped): 3' 2" x 8' 2" x 0' 0"
Other (Vaulted): 13' 4" x 8' 2" x 21' 0"
Other #2 : 8' 8" x 5' 2" x 8' 0"
Foyer : 6' 0" x 5' 0" x 8' 0"
Dining Room : 11' 4" x 12' 4" x 8' 0"
Great Room (Vaulted): 13' 4" x 25' 0" x 21' 0"
Utility Room : 5' 4" x 6' 0" x 8' 0"
Garage : 20' 2" x 21' 4" x 0' 0"
Master Bedroom (Cathedral): 11' 4" x 14' 4" x 12' 0"
Bedroom #2 : 10' 4" x 11' 4" x 8' 0"
Bedroom #3 : 10' 4" x 11' 4" x 8' 0"